I love to see rainbows within innovative design. We often see such a modest spectrum of colour within good design that it’s refreshing to find designers who embrace the whole rainbow! Today we visited one of the world’s best examples of colour-well-done in a children’s bookstore. 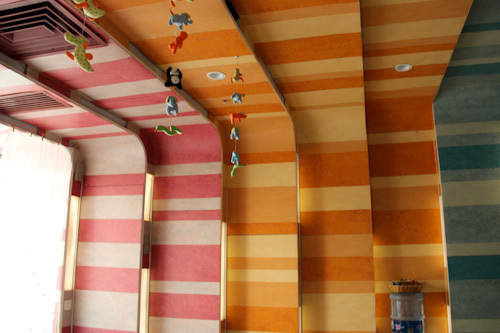 Some designs are iconic, and when the Japanese firm SAKO was awarded China’s 2007 official interior design award for a commercial space for their colourful and innovative interior of a children’s bookstore, they received a lot of international attention. The world was starting to pay attention to the construction projects happening in Beijing ahead of the 2008 Olympic Games, and suddenly Asia was where cutting-edge — and sometimes gaudy — design was being show-cased. 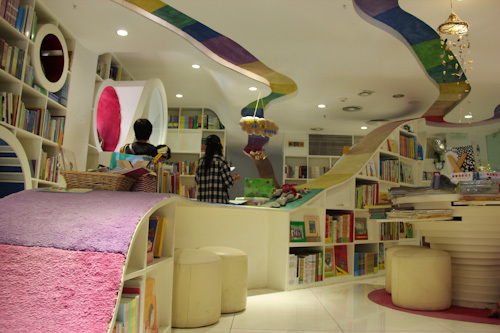 Our hotel’s proximity to the Kids Republic Bookstore in the Chaoyang District of Beijing means that a visit to see the rainbows and browse the books was the perfect excuse to lure the girls out of the hotel and explore some of the city on foot. The location of the bookstore was a bit tricky to work out (given that I don’t read Mandarin). 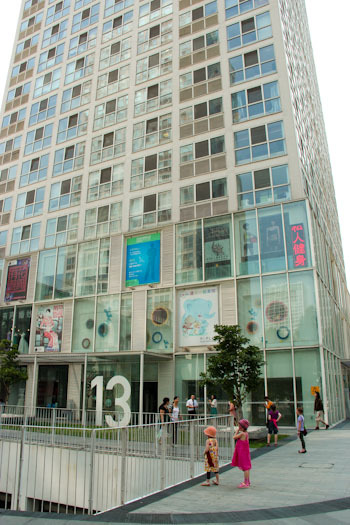 However, I pinpointed its location on maps as Pupulan Huibenguan and despite some online confusion, it’s definitely located in Building 13. The bottom floors of the SOHO office buildings are comprised of retail spaces, and Kids Republic's presence is obvious by the colourful circles in the windows. An assorted selection of shoes inside the entrance prompts us to remove our own. 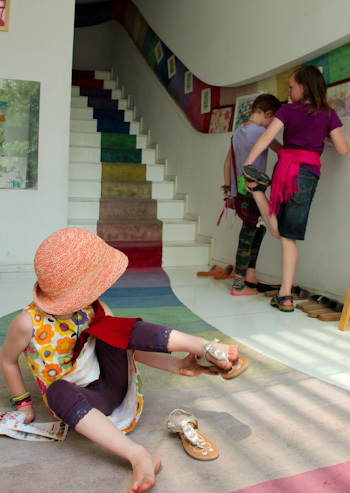 The rainbow of carpet begins at the front step and continues in an unbroken ribbon up the stairs, around the shop, and back down along the wall to the front door. 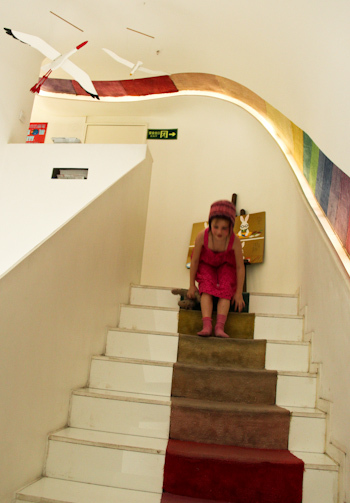 An open-door reveals that the side room — used for story-time and workshops — continues the rainbow theme along the walls. I follow the girls as they make their way up the stairs, listening to them identifying their favourite colours in the carpet. It *is* a bookstore, after all, and amidst the rainbows, we're greeted by a great selection of Chinese books and a few choices in English. 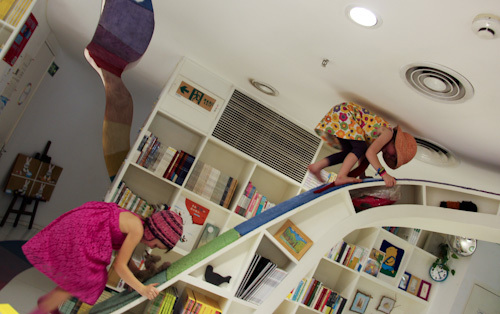 The bright colours entice the younger girls to climb as many of the bookcases as they can. 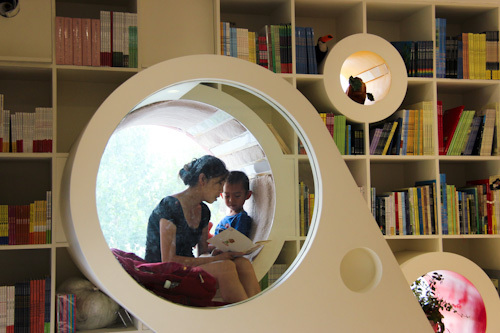 But sadly for us, all of the reading nooks are already occupied. 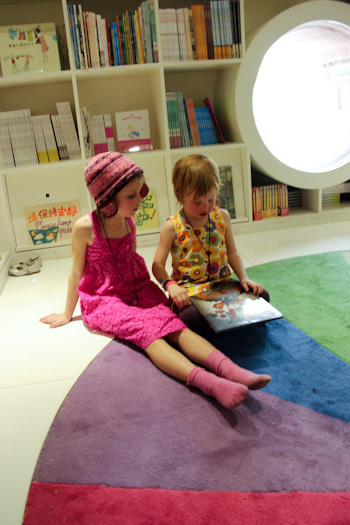 The girls find a book that interests them and settle in a concave rainbow dish of carpet. All the English-language books are wrapped in plastic, so we look at picture books instead. 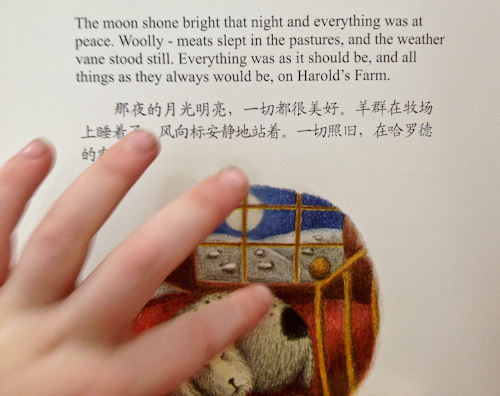 The girls finally locate a bilingual storybook, and I read the Chinglish words aloud while Lana helpfully points out a woolly-meat asleep in the pasture. 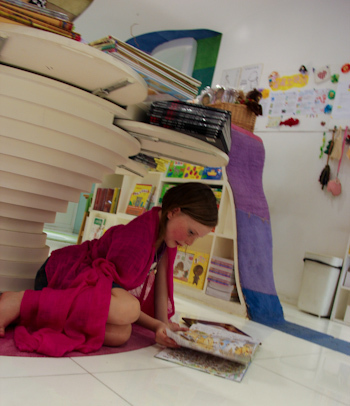 Kids Republic Bookstore is beautiful, colourful and very enticing. We're only disappointed by the size — all this rainbow ribbon is squeezed into quite a small space! 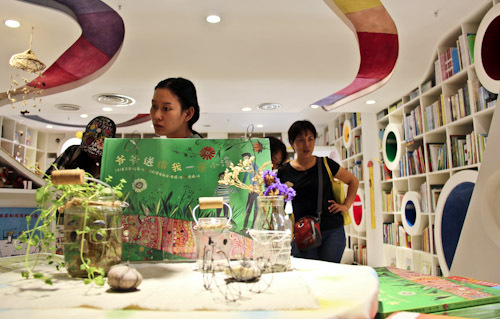 While Beijing’s Kids Republic is no longer as bright and shiny as when they first opened their doors six years ago, the concept of colours, round reading-nooks and climbing structures — in a bookstore! — is worth emulating. I’m glad we’ve seen it for ourselves — we like to add colours into our bus’ interior — and I hope to see more well-designed rainbows in our future travels! I love this. Sadly, bookstores seem to be very far and few between around here these days so it’s lovely to see such a beautiful, inviting place such as this. My family and I love to spend hours just browsing through lovely bookstores…and even more so if there’s a cafe attached! Awesome to see you there! I remember the day you told me about this library, and how you were going to stop in there :) Looks like you’re all handling travel as well as you handle it in your own sweet bus :) Happy journeys travellers!